The plant can grow to be 60 or 70 cm in height, but is usually much smaller than this (often about 20 cm). It is a perennial and it is ‘hairy’ plant (see close up of stem LH image). 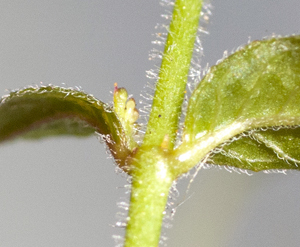 These hairs can be seen on the leaves (both sides) and leaf stalks (petioles) [ left hand image below]. The leaves are sometimes described as downy or soft - (image below). 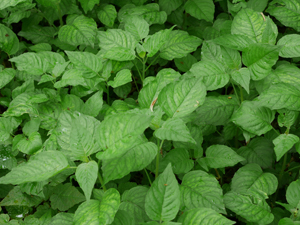 The size of the leaves (like the height of the plant) is quite variable – between 1½ to 3 inches (4 – 7 cm). The leaves are quite broad at the base, but taper towards the tip. The flowers form between June and August. They are usually white, but may be pinkish. 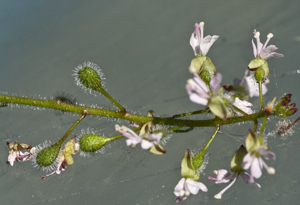 They are quite small, less than a centimeter across and are made up of two petals, two sepals, two stamens and a lobed stigma (where pollination occurs). 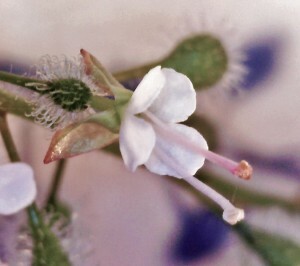 The petals have ‘cuts’ or notches in them, which partly divide the petals. 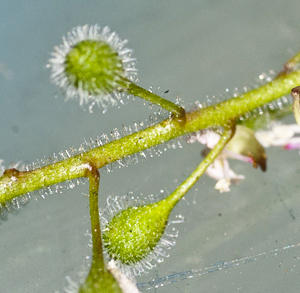 The sepals are hairy (use a hand lens and have a look). 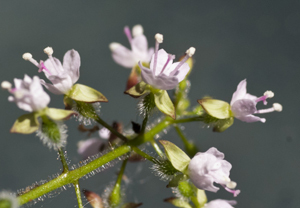 Each flower ‘sits’ on the end of a stalk and many flowers (collectively termed the inflorescence) are gathered together at the top of the plant (in a structure called a raceme). The fruits that form have small bristles that help them cling to clothes or the fur of an animal (see image below). 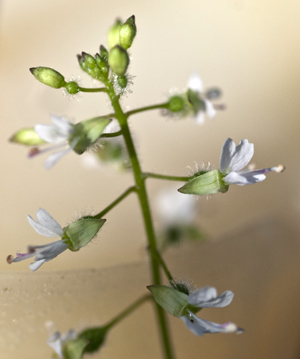 Enchanter’s nightshade or Circaea lutetiana; this nightshade is a member of the willowherb family (Onagraceae). It is not related to other nightshades such as the deadly nightshade. It is found in shady woodlands, coppices and some hedgerows. 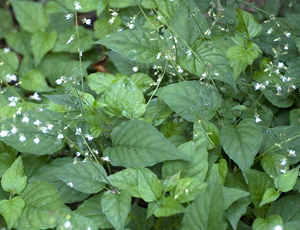 Enchanter’s nightshade tends to like moist, shady conditions. Enchanter’s Nightshade seemingly gets its name from Circe who enchanted Ulysses’ crew In Homer’s Odyssey.